Eat and drink this Cinco de Mayo! 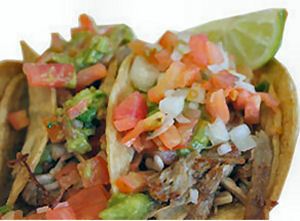 Taco trucks are becoming very popular in major cities and that’s why we’re providing you with recipes that you can make this Cinco de Mayo. 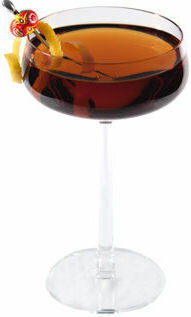 Of course, the day is no celebration without a few cocktails, so we have those too with the help of Espolón Tequila! Stir all ingredients with ice in a chilled mixing glass. Strain into a chilled coupe glass. Spray and garnish with a lemon peel. 1. Combine chicken, orange juice, pepper, garlic salt and salt in a bowl. 2. Refrigerate and let marinate overnight. 3. Sauté chicken in a hot pan until cooked through. 4. Dish into taco shells and garnish with your favorite toppings. In a shaker mix tequila, ginger syrup, lemon juice, lime juice and chocolate bitters with ice. 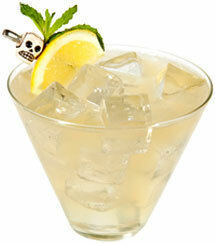 Shake and strain into an iced highball, leaving enough room to top with chilled ginger beer. Garnish with lemon and mint. 1. Heat oven to 300° F.
2. Place the pork in the center of 2 large sheets of aluminum foil and season meat on all sides with the salt, pepper, cumin and chili powder. 3. Spoon the sugar over the pork, turning to coat. 4. Scatter the jalapeños and onion around the pork. 5. Fold the double layer of foil around the pork and seal edges tightly. 6. Place in a baking dish and roast until fork-tender, about 4 hours. 8. Unwrap the pork, and pour juices into separate container. 9. Use a fork to shred the pork, placing shredded pieces in a large bowl. 10. Pour the cooking juices, onion, and jalapeños over the pork and toss. Squeeze lime over pork mixture. 11. 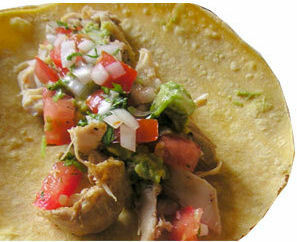 Spoon pork mixture onto individual tacos and wrap. 12. Garnish with cilantro leaves and lime.